The meaning of the abbreviation BTU is British Thermal Units. You will see it in the description of tent heaters, so I thought it would be useful to say a bit about it and have the text as a reference. So really, what is BTU for a winter camping tent heater? Calculate the tent’s Volume = Length x Width x Height. There is nothing really exact here, so no need to include every inch, do it roughly. This will give you the Volume, say in cubic feet. Tents are rarely like boxes so the true volume is much smaller so the given formula may be reasonably good for cabin tents only, like Kodiak and Springbar tents. What if this is a bell-shaped tent like this Danchell tent? Then the volume is close to a conical object V = 3.14 x R² x H/3. Here, R is the radius of its base and H is its height. But how about a tunnel tent? This is similar to a half of a cylinder so the Volume = 3.14 x H² x L. Here H is the height and L is the length. A dome is more complicated but you can approximate it by a half of a sphere. Use this volume calculator to help you. Define the temperature you want/expect to have in the tent. Now from this number, subtract the absolute value of the expected outside temperature. This will give you the Temperature Difference you will need below for the calculation. So the heater/stove should be able to develop enough heat to raise the tent’s temperature to your desired/defined number to compensate for the loses through the walls and vents. If you work with degrees Fahrenheit, the required BTU is equal to Volume x Temperature Difference x 0.133. If you work with degrees Celsius, the required BTU is equal to Volume x Temperature Difference x 0.2394. Assume that the tent has the Volume of (L x W x H) 10 ft x 10 ft x 7 ft = 700 ft³. Let the absolute Temperature Difference in Celsius is 30 degrees, i.e, -10 C outside and you want 20 C inside. You will need a heater with the BTU = 700 x 30 x 0.2394 = 5027. If you prefer Fahrenheit, this would mean 14 F outside and 68 F inside. So BTU = 700 x 54 x 0.133 = 5027. Note that the exact meaning is 5027 BTU per hour. The heaters currently on the market are designed so that you can choose the BTU/hour output and you usually have a range which they are designed for. So this costs money if you buy the fuel for a heater instead of using a wood burning stove and use the free wood around. 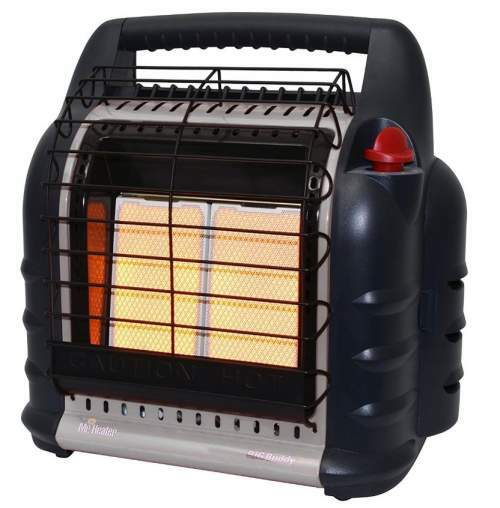 In the descriptions of heaters, some manufacturers give the tent’s area which the heater is supposed to be able to heat. But this is quite meaningless, you heat the tent’s volume, not the area. This all also depends on the tent construction. If you have a tent with a mesh on the ceiling, you will be heating the Universe from your pocket. No need to be a theoretical physicist (by the way, I am one of them) to know that this is pointless. So you need a tent with an enclosed design and also with a proper ventilation system. Many of such tents are in my list of cold weather camping tents. Note that some of them have PVC windows and, as a rule, they have no mesh on the ceiling. Now back to the example I gave above, for the numbers given, this Mr. Heater F232000 MH9BX Buddy should be more than strong enough to do the job. The tent material (canvas, synthetic, insulated tent or uninsulated). Did you know that there are insulated tents on the market? They are good enough to be used without any heater, see for example this Crua Loj 6, Crua Tri 3, and Crua Cocoon tents, those are unique tents and currently the only insulated tents on the market known to me. But if you still use a heater inside of such a tent, you will need very little heat to get to the desired temperature. The floor material (floored tent on a wood platform, without any platform, non-floored tent). The insulated tents mentioned above have an insulation layer on the floor as well. External conditions (cloudy, windy, clear sky, etc). You can find much more in this link with some serious calculations.